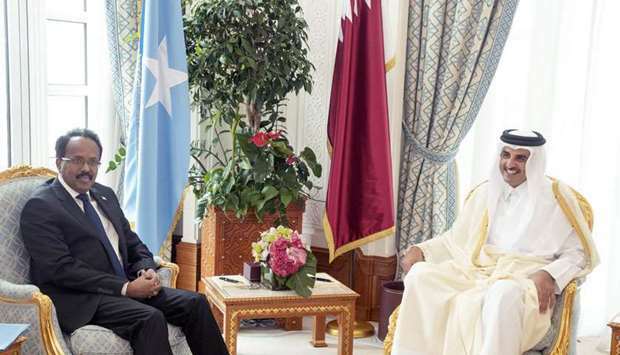 His Highness the Amir Sheikh Tamim bin Hamad al-Thani discussed with Somalia’s President Mohamed Abdullahi Farmaajo the strong bilateral relations between the two countries and ways to boost and develop them in various fields. During the talks held on Wednesday at the Amiri Diwan, the developments in Somalia were reviewed and the Amir directed to support the Somali government budget for 2019 with QR73mn. The discussions, attended by a number of ministers, covered a number of regional and international issues of common interest. From the Somali side, the discussions were attended by members of the official delegation accompanying the President. His Highness the Amir hosted a luncheon banquet at the Amiri Diwan in honour of the Somali president and the delegation accompanying him. The banquet was attended by ministers. This is the third visit of Farmaajo to Qatar since his election in February 2017. The delegation accompanying President Farmaajo included the Minister of Finance Abdirahman Duale Beyle and Minister of Ports and Marine Transport Mariam Aweis Jama. Qatar has strong relations with Somalia which are an example of the strong ties inherent in the two countries’ common history. The mutual visits of senior officials of the two countries have strengthened these ties.